Taking proper care of your contact lenses is the best way to make sure they stay clear and comfortable. But with so many products on the market, it’s hard to know if you’re cleaning your contact lenses the right way. Luckily, we’ve compiled this helpful guide to taking care of your lenses. Cleaning your Contact Lenses: A Step-by-Step Guide. Step 1: Before cleaning your contact lenses, make sure your hands are clean! Wash them well – but try to avoid soap with moisturisers as this can damage the plastic. If you dry your hands with a towel or tissue, make sure you don’t pick up any fluff that could transfer to your contact lens. Step 2: Remove one contact lens carefully from your eye. Step 3: Place your contact lens in the palm of your hand. Using a few drops of solution, rub the lens with your finger. This will remove any protein build-up, cosmetic residue, dust or dirt from the lens. Step 4: Using your solution, rinse the lens again. This step is important to completely clean your lens. Step 5: Make sure your contact lens case is clean and free from old solution. Place your clean contact lens into the case, and fill with fresh solution. Close the case, and leave the lens to disinfect for the recommended amount of time. You will find this information on the packaging of your solution. Step 6: Repeat all the steps above for your second contact lens! IMPORTANT : Do not clean your contact lenses or contact lens case with water. No matter how well you clean your contact lenses, if your contact lens case is contaminated you may still get an infection! There is a lot of conflicting advice on how best to clean contact lens cases. But here at Feel Good Contact Lenses we believe your eyesight should be top priority – so we’ve compiled a best practice guide to keeping your case clean after use. Step 1: Having stored your contact lenses overnight, open your contact lens case and remove your contact lens. Step 2: Insert the clean contact lens into your eye, and pour away the used contact lens solution. 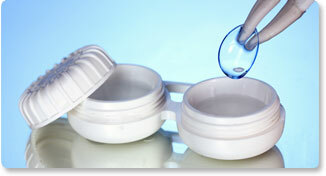 Step 3: Rinse the contact lens case using a saline, or multi-purpose solution. Step 4: Turn the contact lens case upside down and leave to dry on a clean surface. Step 5: Repeat this process daily. We recommend that you change your contact lens case monthly. This will ensure your contact lens case is a clean and safe environment to store your lenses. Choosing the right cleaning solution for your needs can make a world of difference! Nowadays most cleaning solutions on the market are multi-purpose – designed to rinse, clean, disinfect and store your contact lenses. There are other products on the market designed for more specialised use – products for sensitive eyes, and heavy deposit build-up. We have listed details about some of the most common specialist cleaners, and tips on how to use them safely. Hydrogen peroxide cleaner is preservative free and ideal for contact lens wearers with sensitive eyes. Unlike popular multi-purpose solutions however, it must be used alongside other contact lens care products. When used on its own, hydrogen peroxide can cause stinging, redness, and even damage the cornea. For these reasons it is important to neutralise the product after use. All hydrogen peroxide products sold by feelgoodcontacts.in come with contact lens cases with built-in neutralisers – so you don’t have to worry about neutralising them yourself! Enzymatic cleaner has been specially developed to remove protein from your contact lenses. We recommend using an enzymatic cleaner on a weekly basis. Usually found in tablet form, the cleaner is used with saline or disinfecting solution. Step 1: Perform your daily contact lens cleansing routine before using your enzymatic cleaner. Step 2: Fill your lens cases with solution, and add an enzymatic tablet to each. Wait for the tablets to dissolve fully, and then add your contacts. Step 3: Leave your contact lenses to soak in the enzymatic cleaner for as long as advised on the packaging. Step 4: Some enzymatic cleaners require you to disinfect your contact lenses after use. Others are compatible to soak with disinfecting solution, removing the need for this second step. Read the packaging of your enzymatic cleaner carefully to find out.